Consumption has been a bedrock of the U.S. economy for more than a century, but it exploded after WWII when, freed from the struggles of the Depression and the constraints of the war, returning GI’s were eager to buy vast array of consumer goods—including jewelry. 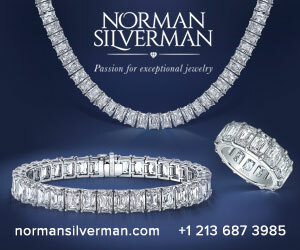 It’s no coincidence that the greatest ad slogan of all time, “A Diamond Is Forever,” was coined in 1948. The GI’s showered their Baby Boomer children with goods; Boomers in turn showered their own Millennial children with even more goods. 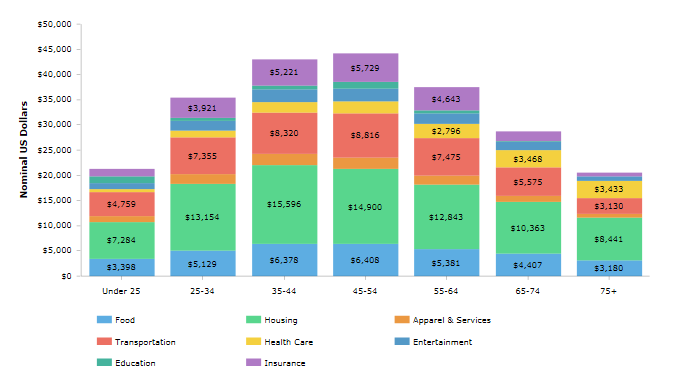 But adult Millennials are a paradox: both the most wasteful and the most frugal of consumers. They're more likely than Boomers to spend money on costly "small luxuries" like expensive coffee and taking a taxi or Uber, vs. public transit, than earlier generations, and of course it's no secret they prefer to spend money for experiences instead of things. And the jewelry industry is painfully aware of the challenges of dealing with them. With high student debt and career starts delayed by the Great Recession, they’re also facing much higher housing costs than earlier generations. “Retail Prophet” Doug Stevens says Millennials’ 2016 income was about 34% less than it would have been if the 2008 financial crisis had not happened. 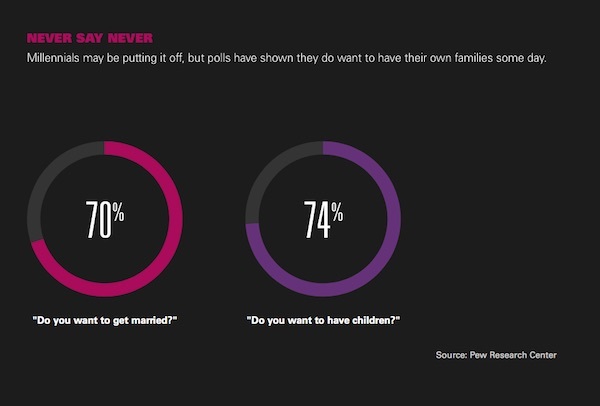 No surprise they’re forming households, marrying, and having children later. 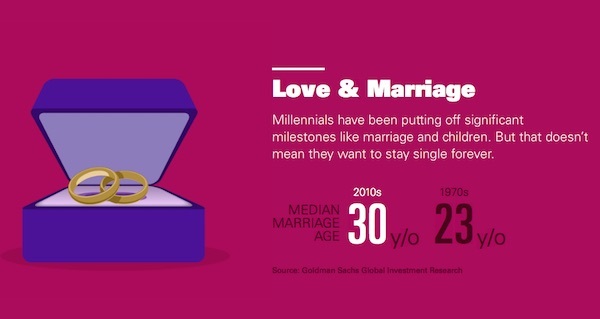 A Goldman Sachs data story about Millennials says the majority have delayed milestones like marriage and children, but that doesn't mean they will give it up entirely. Charts above and below, Goldman Sachs. But a study from Morgan Stanley Wealth Management offers new intelligence on Millennial spending habits and there’s some good news for most consumer product categories: even if it’s later, as Millennials age into each successive life phase, their spending is increasing. For instance, 89% of Millennials still plan to buy a home, says the study—12% more by proportion and significantly more by numbers than Generation X. Currently, about 80% of Boomers own homes. Despite the late start, Millennial employment is improving and as more households form, it means more opportunities for diamond and jewelry sales to mark emotional milestones, even if those are not always traditional engagements and marriages. But American Millennials are souring on traditional luxury brands, says Danziger. She cites figures from the latest Bain Luxury Study showing American Millennials behind their global counterparts in purchases of high-end fashion and luxury goods. When asked how many high-end or fashion luxury items (defined as costing $500 or more) they bought in the last 12 months, more than one-fourth of respondents answered “none.” While the majority (71%) of respondents did buy luxury items in the previous year, Danziger feels the growing number of consumers who eschewed such purchases is high enough to warrant at least some concern. In a sample of affluent Millennials, she found they’re most motivated by quality, uniqueness, and ethics. Conversely, calling an item “luxury” does not necessarily motivate them to buy—and when they sense the term is just a marketing buzzword, they’re turned off. Millennials will look behind the curtain, as it were—and they know they can acquire high-quality products at significantly lower prices than traditional luxury brands. Brands must make their product relevant to Millennials not by stressing luxury as a label they should aspire to own but to convey true meaning and value, she says. Finally, she says, e-commerce is essential. It’s not enough to be online just for branding and marketing; omnichannel is a must. Related: Tax Fairness, But At What Cost? Danziger isn’t alone in her concerns about traditional luxury brands’ appeal to Millennials. An article in Luxury Daily says leading “attainable luxury” brands like Michael Kors, Coach, and Ralph Lauren are failing to attract the youngest Millennials or the oldest of Gen-Z, the next generational cohort. Luxury Daily says these brands still have enough appeal to older consumers that it’s been easy to overlook the growing disinterest of younger consumers, but it will hurt their bottom lines later if they don’t address it now. MVI's findings, meanwhile, show that attainable luxury brands are highly desired by Millennials, they've just switched their brand alliance. Not all heritage brands are headed for trouble. Gucci is 20 years older than Coach and 60 years older than Michael Kors—and has had its own doldrums—but at present it has found ways to appeal to younger consumers by pushing the boundaries of experimental, unapologetic fashion and modern marketing, says Luxury Daily. And MVI's research shows it's been very successful in its efforts to attract Millennials. How does this all relate to jewelers? As the latest Real Is Rare survey by the Diamond Producers Association found, almost 2/3 of Millennial women (64%) say they’d rather purchase one good luxury item over lots of cheaper items. They’re also not fond of knockoffs, with 60% saying they’d be embarrassed to own one, and 89% looking for authenticity when purchasing a luxury item for themselves. 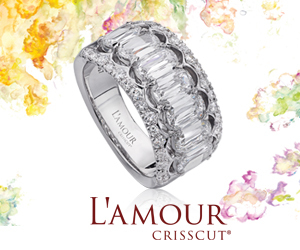 Respondents also said diamond jewelry is something they consider a long-term investment and something that makes them feel more confident. The DPA may be onto something. 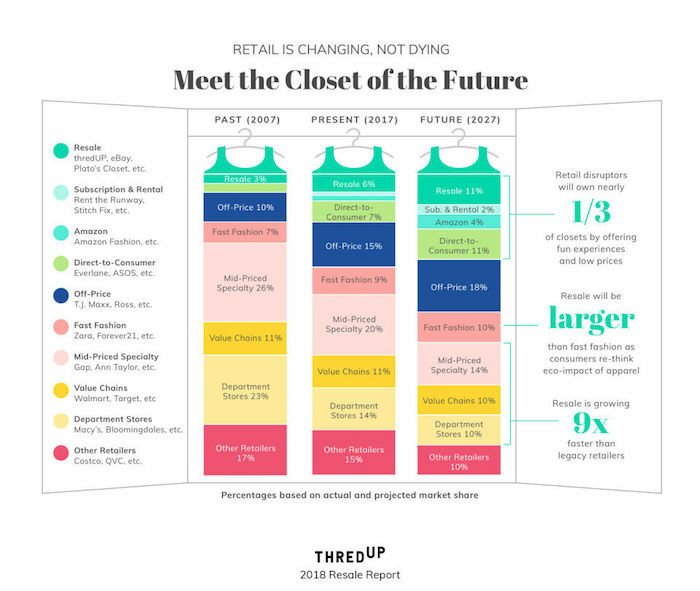 In April, Thredup, a leading online resale site, released its annual report covering both the present and future of the resale market. It confirms the growth of resale as one of the biggest shifts in retail (especially online, which is outpacing both offline resale and off-price discount retail). The resale market is on track to hit $41 billion by 2022, with almost half of that coming from the apparel sector. One of the three leading online resale disruptors is TheRealReal, which specializes in luxury brands only and offers a robust selection of jewelry and watches. (Click here for the list of jewelry designers on TheRealReal.) ThredUp and Poshmark, the other two leading online apparel resellers, offer all brand tiers. Millennial consumers are paradoxically the most wasteful and the most focused on sustainability. They’ll upgrade their phone or tablet every year and discard fast-fashion outfits after only a few months, yet they want to buy from environmentally-conscious brands. “Corporate responsibility and social responsibility is an entry [to the market], not a set-apart,” said Doug Stephens during a presentation to retailers at the Plumb Club breakfast in Las Vegas this year. And they’ve discovered thrift shopping and sharing sites to assuage environmental guilt while still rotating their wardrobe, not to mention saving on luxury brands. Fast fashion’s share of the apparel category still has grown 3% since 2007, while both resale and off-price have grown 8%. Rental/sharing didn’t exist in 2007 but it accounts for 2% of the apparel market now. Meanwhile, traditional department stores’ share has shrunk 13% and mid-priced specialty chains (i.e. Gap, Ann Taylor) have lost 12% share of market. Experience matters to Millennials (and Gen-Z), and this covers both spending for experiences and the experience of spending. “Social currency is not what they own but what they do,” Stephens told the jewelers in Las Vegas. He cited findings from Forrester Research that show if a brand can move up even 1% on experience, it comes back in money.